These are people we know and trust to farm ethically and sustainably. If you’re a New Zealand-based wool farming family and would like to talk to us about including your yarn on this website, please contact Janette. Central Otago is a region of New Zealand which boasts several world class industries, including wine growing and sheep farming. Its stunning scenery, acts as a seductive disguise of the region’s wide-ranging weather conditions - everything from stunningly cold winters to hot dry summers. 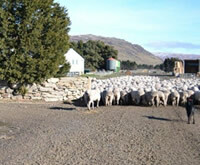 Buy organic merino knitting yarn from Lammermoor Station or contact us with your enquiry. Join up on the website today and go in the draw to win 20 balls of your colour choice from this amazing farm. The Waikato region is arguably, the hub of North Island farming. The glow worms at Waitomo Caves act as a beacon to thousands of visitors each year while those with a keen interest in horses, will find a well established horse breeding and racing industry up the road, so to speak, in Cambridge. 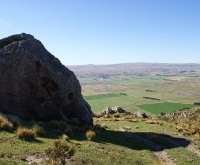 Te Toko Station is set high in the hills of the King Country, just a 20 minute drive beyond the caves. With its sprinkling of limestone rock formations and border of native bush, it is a truly picturesque spot. Five years ago Kim’s parents, Bob and Judy, handed over the day to day management of the property to Kim. But you can’t keep a good keen farming man down! At nearly 70, Bob still gets out and about on his quad bike just to keep an eye on things. 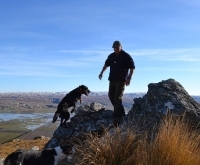 With several thousand Perendale sheep and 500 cattle, there’s plenty to do. The Osborne’s have owned and farmed the station for 25 years and have covenanted a considerable amount of native bush to preserve it for future generations. Kim has continued to make more of the station accessible by creating tracks around its amazing landscape. Its steep drops and weaving paths delight visitors. Buy Perendale wool from Te Toko Station or contact us with your enquiry. This is where the story begins…. Briar Patch was originally Janette’s 12 acre farmlet on the outskirts of Christchurch. 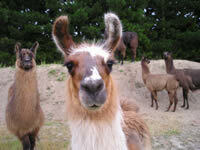 This is where she began breeding llamas and black sheep in 2005. Sadly, the Christchurch earthquake destroyed Briar Patch’s office in the centre of Christchurch City, but this story has a very happy new beginning! When the Briar Patch farmlet was sold in 2011, Janette’s partner Kim Osborne from Te Toko Station, managed to persuade her to relocate to Te Toko Station. So, Janette packed-up the Llamas and black sheep and headed 560 miles (900 kilometres) north to live with him at Te Toko Station at Waitomo Caves. The Briar Patch llamas and black sheep haven’t looked back! They’ve long since settled into their own special paddocks close to the homestead.